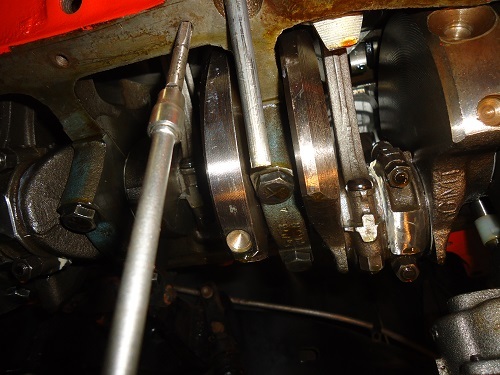 Inspection and rebuild of the 327 Chevy engine bottom end included pistons, rods, crankshaft, harmonic balancer, and oil pump. If you're not pulling the motor out of the car, oil pan removal will require loosening the tie rod assembly and swinging it out of the way. Having the car on four jack stands makes this possible. After the oil pan is removed, all traces of the old gasket were cleaned with a razor blade and gasket scraper. All 327 engines that went into Corvettes (until the 70s) had a forged crankshaft. The easiest way to tell is, a cast crank has a thin casting line, and a forged crank has a thick casting line. 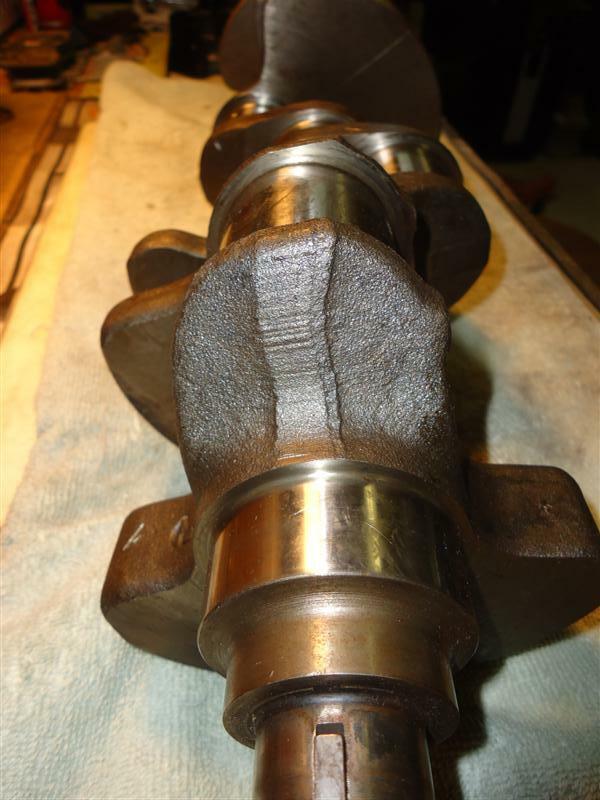 The image below is a 283ci forged crank. 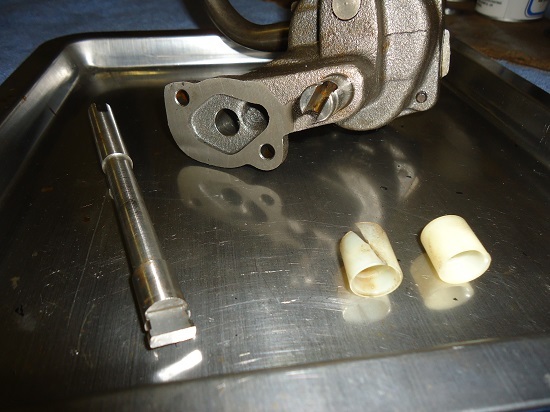 Up until it's last year of production (1968), Chevy 327 small-blocks had a smaller journal crank and connecting rods than the later 350ci small blocks (11/32" rod bolts until about 1968, large-journal rods had 3/8" bolts). 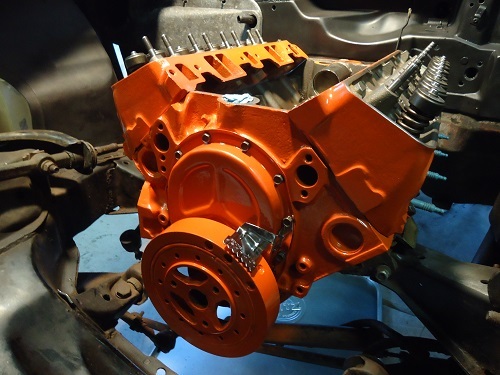 Small-block Chevy engines were designed with a very good lubrication system. 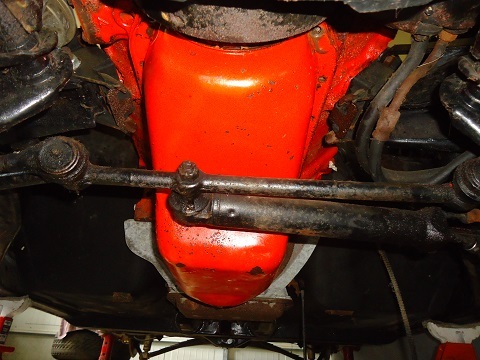 The 327 bottom end in the pictures has a new Melling M55 oil pump and shaft. Because of the age factor, I replaced the shaft bushing. The old one was tight (as it should be) and needed to be cut off with a razor-blade. 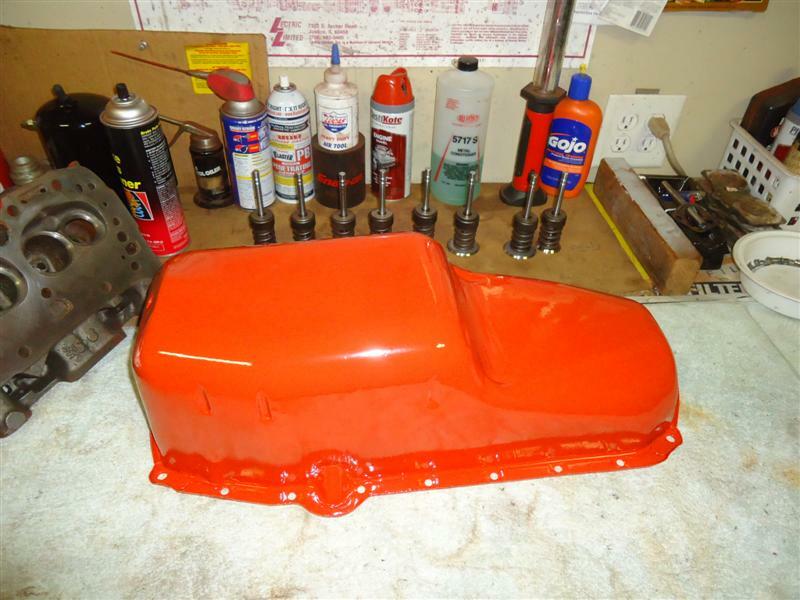 The oil pan was sanded/scuffed down to bare metal and painted Chevy Orange with a spray can (no primer needed). 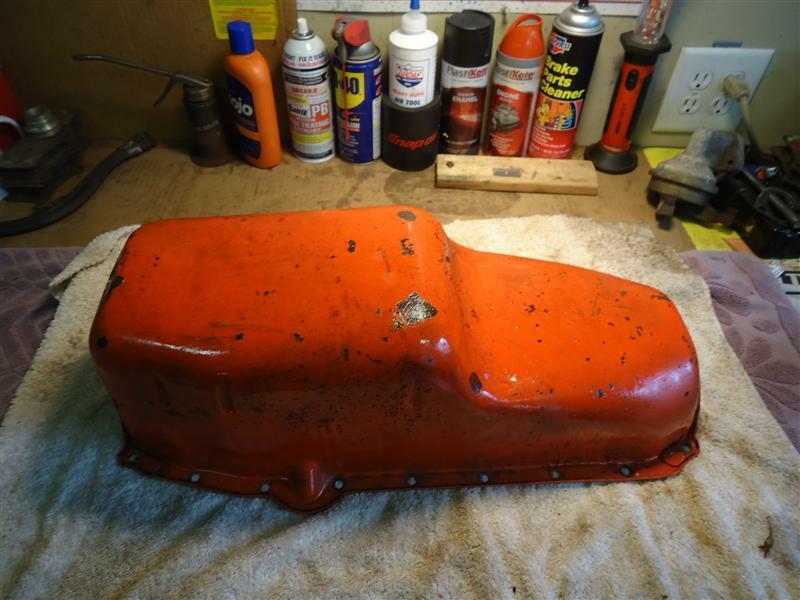 Before the pan was bolted back up, the oil pan bolts were soaked in brake parts cleaner, and the bolt holes in the block were cleaned and tapped. Most oil pan gasket sets will come with both a thick and thin front oil pan seal. Early small-block engines had a thin front oil pan seal. You'll need to check to see which one to use. 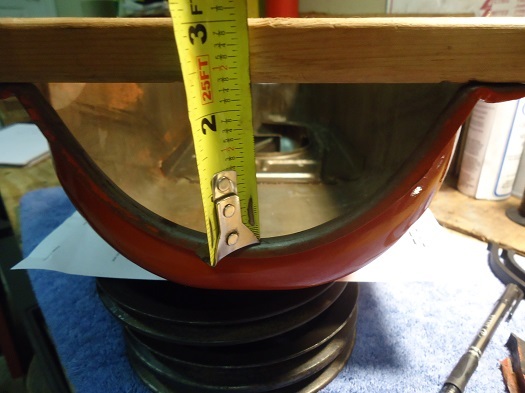 To find out which front seal you need, lay a straight-edge (ruler) across the front of the pan and measure the depth of the "half moon". A 2-3/8" measurement requires the thick seal, 2-1/4" requires the thin seal. Several aftermarket companies offer a one-piece oil pan gasket for the small-block Chevy, but are thicker than the original gasket and may require longer oil pan bolts to properly secure. I've never had leakage issues with the 4-piece gasket, so I continue to use them. 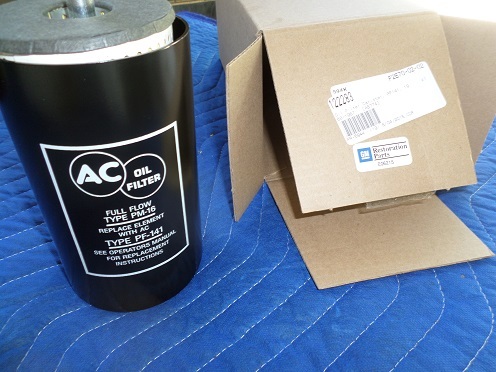 Two types of canister oil filters were used on first-generation small-block Chevys. Filter #PF131 is for 1956-1957 SBCs, and filter #PF141 is for 1958-1967 SBCs. Through the years, many of these original canisters were taken off and replaced with the less-efficient but easier to replace spin-on oil filter. This engine was missing one, so I bought a replacement oil filter canister from Ecklers. These canisters are licensed by GM and very authentic. Before installing the new oil filter and gasket, make sure you get the old gasket out. Sometimes it hard to tell it's still up there. Use a sharp awl or pick to stab it and pull it out. The original seal is square and should come with the new cartridge filter. Several harmonic balancers were used on small-block Chevy engines, depending on the horsepower of the motor. 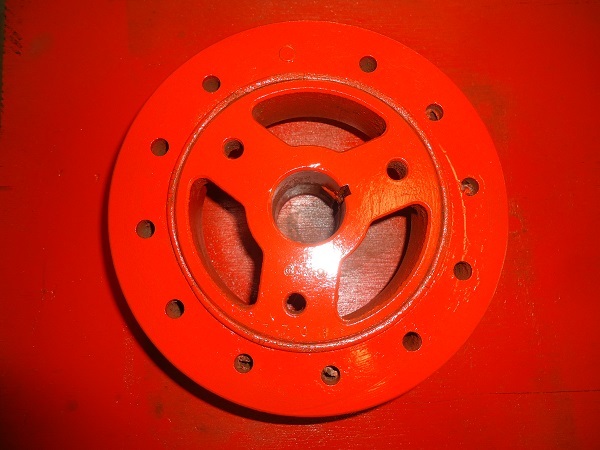 There are three bolts holding the crank pulley to the damper. 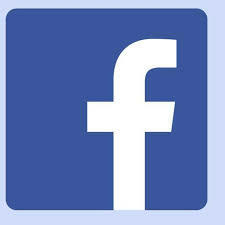 327 crankshafts never came from the factory with a harmonic balancer bolt, but it was, and still is, a popular upgrade. The crank from this engine had the fourth bolt in the center. Always check that the timing pointer is correct for the engine. Otherwise, you'll never set the timing correctly.